HalalVital is first to offer vitamins & minerals online to the fastest growing targetmarket of 1.8 billion Halal certified with ROI of 20% expected. Invest! This crowdfunding campaign is already succesful, but we are currently running a second campaign which is still open for investors. Click here to invest in our unique proposition. HalalVital, for a better life. INVEST NOW! HalalVital produces and offers 100% natural quality vitamins and minerals, Halal certified to guarantee the quality. HalalVital is one of the first organisations specifically offering products for this enormous market. The Halal market has a global turnover of 2 trillion p/a! Our ability to identify the disbalance in health, we know exactly what ingredients are necessary to stay healthy and to restore a healthy balance. Our products will be embraced by the market because the resonate with the values of today. 100% natural, proven and because of the Halal certificate; it guarantees that the products are being produced by the highest possible standards. There are virtually no producers that produce and distribute vitamins and minerals that are Halal certified and operate in the market the way we do. Our strategy makes us so flexible and scaleable, that we can adjust to the market continuously and can anticipate and grow due to the e-commerce developments in this branche, complemented by other channels. The expert knowledge for product development, international approach, communication and IT make HalalVital an unique organisation. The total target market is 1.8 billion people with 51% younger than 25 years; a target market for a long term! This target market searches for products fitting their lifestyle. So it is essential to get on board and not miss this opportunity! Product developers, marketing and IT experts, HalalVital has got all disciplines under one roof. 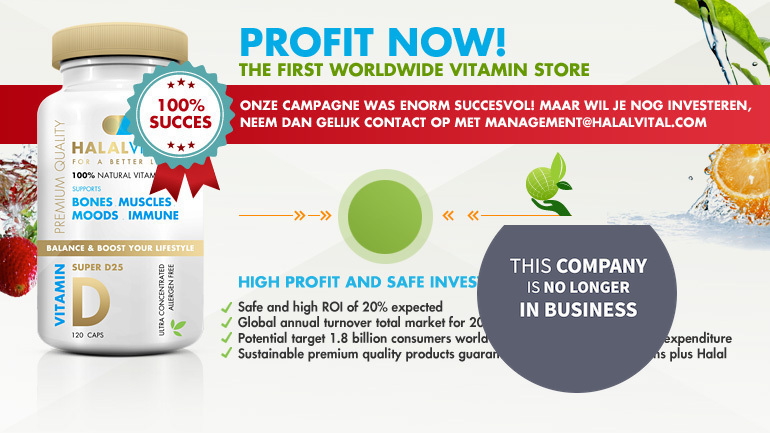 The founders are Jan-Dirk Troost and Werner Jentjens; 2 successfull businessmen with a track record in developing and distributing vitamins and minerals successfully for many years in The Netherlands. CEO Nienke Ryan, a successful and driven enterpreneur, has been appointed for her knowledge in international distribution, organisation management and introduction of new products into the market via distribution channels as well as online. With this knowledge and expertise they saw this (huge) niche market and with Halal Vital they have the opportunity to convert this huge potential into a high return. Due to the expertise, knowledge and experience, the complex proces of Halal certification and communication with this targetmarket, it is very hard for new players to enter this market. For current players is the existing channel an obstacle; they would be cannibalising on their existing channels and networks. The businessmodel of HalalVital is set up flexible and scaleable to set HalalVital apart from her competitors. By anticipating on the enormous worldwide potential in an early stage, HalalVital can establish a market leaders position and maintain this through her passion: only when we are healthy and feel optimal, we are in balance physically and mentally so we can develop ourselves and enjoy the opportunities that life offers us. If we feel good, we can do good. Part of the profit is being donated to provide a better life for children. By offering natural, healthy and high quality products, HalalVital enables everybody to choose for products that are conform the ethical value and norms and contribute to a better life for all. It is our goal to position the company within 3 years as a market leader in 25 countries with a complementary product portfolio of 75 vitamins, minerals and other health products that improve wellbeing and the quality of life. Distribution is mainly online but complemented by other channels. This results in higher profits and thus higher returns. But also in direct communication and interaction with the market. This enables the company to anticipate instantly on the demand and the organisation's goal is to have 250.000 end users in her network to generate 2.5 million Euro's per year. Incentive for investors: get on board and share in the profits! We give 4% away to early investors and give them the opportunity to buy shares. We expect a minimal return to be between: 15% - 20% but expect the realistic return to be much higher (see also attachments). So invest now! -Invest € 5.000 or more and receive an abonnement (3 vitamines of your choice per jaar) for 12 mts value: 700 Euro. -Invest € 2.500 and receive an abonnement for 6 mts value of over: 300 Euro. -Invest € 1.000 and receive an abonnement for 3mts value of nearly 200 Euro. the abonnement can also be put in someone else's name. Unique and wide range of high quality, 100% natural vitamins and minerals, conform all laws- and regulation AND Halal certified. The expected turnover is based on the current turnover in the market and growth per year. For your information, you can find a breakdown in the attachment 'Turnover per country'. This shows that a large part of the total turnover will be made in China, Middle-East and the U.S.. It also shows the selection of countries Halal Vital has focussed on based on criteria important for Halal Vital to ensure realising the organisational goals. Funds requirement: 130.000 Euro. HalalVital offers 4% shares in return and great incentives! The funds will enable the organisation to implement a strong backoffice infrastructure to facilitate serving the international markets as well as setting up a strong brand and marketing activities to ensure reaching the potential customers and realising a successfull launch in order for the organisation to position herself directly as marketleader. Funding will also be used for product development and production. Together the company will be able to launch its activities. The estimated value of the company of 1.6 to 1.8 million is based on the expected turnover. It is expected that in about 3 years the company will be worth 2.2 to 2.5 million, A huge return! Buy shares to benefit from this growth. Qualified in product development vitamins and supplements in the (international) health industry. Successfull entrepeneur and senior in business development. Jan-Dirk has a track record in distribution of a wide range of health products in European countries and successfully built a reseller channel and strong network. Qualified in business strategy and organisation and extensive experience and track record in setting up, structuring and managing an effective en efficient organisation and resources. Experience in the advertising industry i.e. BBDO and TBWA, contributing and resulting in development of the brand, positioning and marketing, as well as build and growing a strong online channel to reach customers. Roel Berkhout, Senior Consultant - Philips Industry Consulting management advisor for the program Groeiversneller. Program Groeiversneller supports ambitious entrepeneurs realising growth and advises on how to acellerate this. Qualified enterpreneur with track record and senior indevelopment manager. Active for over 10 years in distribution of a wide range of health products in European countries. Extensive expertise in building a successful channel and strong network. Atilla Aytekin, entrepeneur, owner and co-CEO of Triodor Software and OrangeGames. Triodor Software develops software for the High-Tech markt, with locations in Amsterdam, Turkije and VS emplying 300 staff. The double cultural bagage has been one of the main contributors of succes building successful bridges fast between various cultures in the arena of international trade. Mahi has a medical education and work experience in the health industry. He also has over 5 years of experience in international trade. Next to the 7 language, Mahi has built up extensive expertise in negotiation, customer orientated and is result driven. His passion is to facilitate staying and becoming healthy. Zakaria is entrepeneur and has over 15 years experience in the B2C business. His commercial skills and experience with Halal Certification are valuable assets for Halal Vital. He has been involved from the start of the business and is commited to contribute to make Halal Vital a successful organisation. Halalvital produces and offers 100% natural quality vitamins and minerals, Halal certified and conform all law- and regulations to guarantee the quality. HalalVital is one of the first organisations specifically offering products for this enormous market. The Halal market has a global turnover of 2 trillion p/a! In the attachment Turnover by country you can find a breakdown showing the effect of using e-commerce to offer the products worldwide enabling the organisation to reach everybody with an internet connection. Current developments: within a few weeks the first 7 products will be launched. Planned developments: a complementary 15 to 18 products wille be developed before the end of 2015 in order for the product portfolio to be around 25 products. The total targetmarket is 1.8 billion people with 51% younger than 25 years; a targetmarket for a long term! This target market searches for products fitting theirlifestyle. So it is essential to get on board and don't miss this opportunity! The total consumption of Halal Food & Beverage market was in 2012 $ 1,088 billion. That is an incredible 16,6% of the total foodmarket. The expectation is that this will grow in the next 2 years to 17,4% of the worldwide foodmarket in 2018 in absolute figures 1,626 bilion in 2018. By anticipating on this huge worldwide potential in an early stage, HalalVital can position herself as a marketleader and by sound management and set up maintain this position. So make sure you get in now! Due to our expertise, knowledge and experience, the complex process of Halal certification and communication with this targetmarket, it is very hard for newcomers to enter this market. For current players their own network, which is the traditional way the market has been served all these years, that same network is an obstacle if they would want to compete against HalalVital: they would be cannibalising on their existing network. The businessmodel of HalalVital has ben set up to be enormous scalable and enabling the organisation to continously adapt to the demand; this sets HalalVital apart from her competitors. the current feedback is hugely positive; everybody valuating the Halal certificate will choose for the products of HalalVital over the products without a certificate for vitamins and minerals. The number of customers HalalVital is focussing on serving is 250.000 within 3 year. De reden dat deze markt zo’n enorme groei kent gaat hand in hand met de erkenning die Halal producten genieten voor de quality assurance en het Halal label is een symbol geworden voor goede kwaliteit. Om de doelgroep te bereiken wordt met name het online kanaal gebruikt, maar ook wordt er een distributie kanaal ontwikkeld om de producten ook via retail te gaan aanbieden. Echter, de branding van het merk vindt door HalalVital zelf plaats. --Internationale aanpak; door de inzet van de digitale mogelijkheden kan ingespeeld worden op de lokale doelgroep. See attachment Turnover per year. Funds requirement: 130.000 Euro. HalalVital offers 8% shares in return and great incentives! Communication with the targetmarket is a challenge as serving them is not yet done. That is why HalalVital has appointed Pure agency specialised in marketing for this targetmarket as a strategic partner as they have the expertise and knowledge serving these customers in the selected countries.